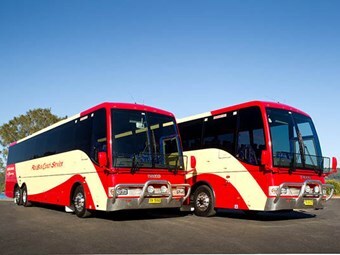 NSW regional operator Redbus joins Busways as the beneficiaries of Transport Minister John Robertson’s expansion plans for the Central Coast region which saw 1500 extra bus services start this week. Redbus Planning and Development Manager David Bain says the company spent five months planning the extensive roll out, with 30 new drivers recruited, 17 buses bought, and 50,000 timetables printed. "It’s been very intense," Bain says. Operating from The Entrance, Redbus run commuter services to railway interchanges at Gosford and Wyong, with more express connections from this week for Sydney bound commuters. "The feedback we are getting from those who use the services say they are extremely happy," says Bain. "One customer phoned at the start of the week saying he had been commuting to Sydney for ten years, and with the new express bus service he has saved half an hour on his travel time." On average, the number of services from The Entrance to Gosford and Wyong has tripled within the past week. ‘We’ve had a massive increase in our services, there’s been change to some of the routes, there’s been new routes introduced, and Sunday services are now at a 500 percent increase," Bain says. "We went from a two hour frequency from The Entrance to Wyong to 20 minutes." To service the increased frequency Redbus ordered 17 Iveco-Custom Coaches CB80s earlier this year, with five delivered in time for this week’s service upgrades. About 7 units are expected to arrive at Redbus’ The Entrance depot before Christmas. Until the new Ivecos arrive, Redbus will lease buses from other operators to meet the new timetables. Redbus also went on a recent recruitment drive to meet the increased services – with 30 new drivers starting with the company over the past five weeks. "We started them several weeks before the implementation date to train them up on the new runs," Bain says. "We got them within a couple of weeks." Employment has been boosted at The Entrance: "And I daresay Busways would be looking for just as many drivers." Bain says the drivers were easy to find. "We didn’t advertise for any of them it was all word of mouth – most of these are drivers who were working in Sydney and commuting for quite a few years – so a lot of them were happy to get local employment," he says. In the lead up to the new services this week, Redbus organised delivery of 50,000 timetables into mailboxes in The Entrance local area – a huge exercise carried out by a private contractor over the weekend prior to this week’s start. Bain says the first week of operation with the new timetables and routes has gone smoothly. Robertson says the new buses will change the way people on the Central Coast use public transport. "There will be more than 1500 extra services every week and that means more late night services, more weekend services and more buses in the AM and PM peak," he says. "The community will notice a big difference to bus services with new routes, greater service frequency and a big increase in the number of buses on weekends." For more information on the new Central Coast Bus Network, call the NSW Transport Infoline on 131500 or visit www.131500.com.au.